PCI DSS compliance has become a driving factor in the security of many organizations. Not only has PCI become a requirement by the payment card industry, but it has become and example to all organizations of how practical security can be implemented and business continuity maintained. For many years the concern over the cost of implementing solutions securely has outweighed concern over the impact of failed security. Over the last few years, growing headline breaches have created an atmosphere of awareness of the damages a breach can cause to an organizations financial structure and reputation. This article will address both of these key requirements - as they relate to remote access. Specifically for networks utilizing MultiFactor SecureAuth authentication for Cisco remote access. SecureAuth for Cisco VPN authentication is designed for enterprises to easily meet the requirement of distributing individual user IDs to end-users. SecureAuth provides a methodology of user self-enrollment, to securely distribute PCI-compliant authentication credentials (X.509 credentials are PCI compliant, see PCI DSS Requirement 8.2). SecureAuth is a two-factor authentication solution that utilizes the SecureAuth X.509 credential and the enterprise-stored password. SecureAuth differentiates itself in the marketplace by providing the easiest to deploy certificate solution to meet the 8.3 PCI DSS requirement. This helps the enterprise meet PCI DSS Requirement #8.4. The enterprise does NOT have to create sync and encrypt a new set of data information. SecureAuth administration accounts are uniquely created and associated with individual accounts, therefore configuration modifications are associated with specific administrators, as outlined in PCI DSS requirement 8.5.1. SecureAuth requires end-users to perform a 2-factor authentication, “certificate + password” before they are allowed to modify their passwords. The PCI DSS 8.5.2 requirement is met by forcing users to strongly authenticate before modification of their password. SecureAuth works in conjunction with the Cisco ASA to reset passwords on first usage. The Cisco ASA sees the “must change password” attribute set in the data store, and gives end-usesr the appropriate screens to change their passwords. SecureAuth for Cisco VPN Authentication requires the end-user to have both a valid SecureAuth certificate and authenticate with a valid password. (See figure #2). If the user is removed from the data store, Cisco VPN, utilizing SecureAuth authentication, will not grant access to that terminated user. An enterprise can set the SecureAuth credential to be valid for 90 days or less, thereby forcing users to re-authenticate every 90 days. MultiFactor SecureAuth has a configurable certificate length that can be set in accordance to security and resource requirements. Enterprises are asked, by PCI DSS requirement 8.5.6, to create credentials that are time-configurable. SecureAuth offers this feature. 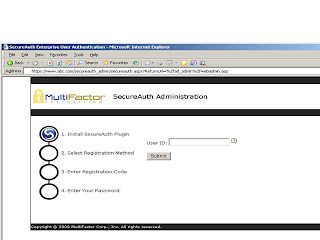 MultiFactor SecureAuth is a user self-enrollment product that “walks an end-user through” an easy process, to obtain a secure credential. Additionally, the product utilizes the enterprise datastore and thus the password policies around these IDs. SecureAuth for Cisco VPN authentication makes this requirement obtainable for enterprises. Users share accounts because of the pain in distributing unique authentication to individuals. SecurAuth’s unique self-enrollment for X.509 credentials makes compliance to this requirement possible. SecureAuth utilizes the enterprise’s Datastore (See Figure #3); therefore, whatever configuration the enterprise sets on its data store, it will ultimately be enforced by the SecureAuth appliance during certificate enrollment. 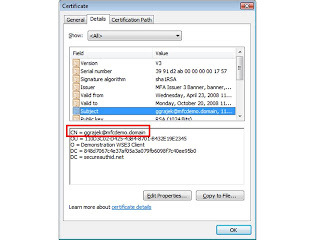 This same policy is also enforced by the Cisco VPN during “AAA + Certificate” Authentication (See Figure #2). PCI DSS Requirement 8.5.11: Use passwords containing both numeric and alphabetic characters. SecureAuth utilizes the enterprise’s Datastore (See Figure #3). ; therefore, whatever configuration the enterprise sets on its data store, it will ultimately be enforced by the SecureAuth appliance during certificate enrollment. This same policy is also enforced by the Cisco VPN during “AAA + Certificate” Authentication (See Figure #2). PCI DSS Requirement 8.5.12: Do not allow an individual to submit a new password that is the same as any of the last four passwords he or she has used. SecureAuth utilizes the enterprise’s Datastore (See Figure #3). ); therefore, whatever configuration the enterprise sets on its data store, it will ultimately be enforced by the SecureAuth appliance during certificate enrollment (See Figure #2). SecureAuth for Cisco VPN authentication has a lock-out feature for registration. The default for this configurable feature is (3) attempts. In accordance with requirement 8.5.14, accounts can be locked out by configuring the data store from which SecureAuth is pulling data (See Figure #3). The SecureAuth/Cisco VPN solution relies on the Cisco VPN settings for session duration and session idle enforcement. 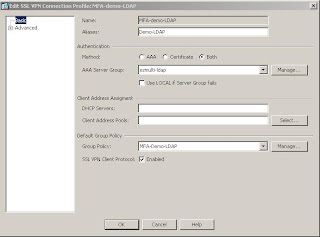 This setting is set in the Cisco VPN, to enforce session idle.